Longer, finer, wider….the challenge continues. This time I certainly went longer. In fact, I think this might be the longest thing I have woven so far on my backstrap loom. It is reasonably fine but it is certainly not wide….. a decorative band to edge my wool lap blanket. I wanted to finish the lap blanket that I had woven some time ago. I thought that I had been weaving the two wool panels this time last year. I can remember feeling really uncomfortable in the summer heat having the panels on my lap as I sewed them together but, when I took a look back at my blog posts from December last year, it seems that I was actually on a silk binge at that time. That is certainly a much more pleasant material to use in the humid Bolivian summer. The fabric for this little yurt-shaped silk pouch was one of several silk projects I had on the loom last December. It is fun to look back at this time of year and remember what I was weaving… and then be horrified at how fast the year has slipped by. I am sure that I am not alone in that. It certainly was an active one for me travel-wise. There was a little less time spent at the loom and lots of time spent on the road gathering inspiration. Anyway….back to the long, long band. My edging band needed to be 112”. I wound a warp of 150” length just to make sure that I would be comfortable weaving right to the end of my 112”. I could weave a few inches to spare, just in case, and I would not be rammed up against the far loom bar trying to squeeze those last inches in. I also needed a fairly large working space as I used 7 sets of heddles so that I wouldn’t need to do pick-up. 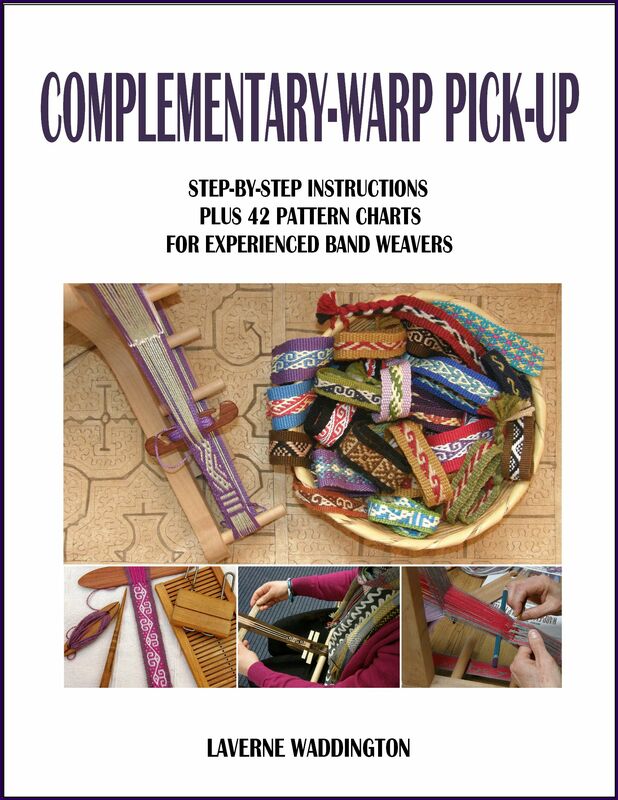 As much as I love having my hands in among the threads picking patterns, this band was too long and the motif too small and repetitive to make the weaving interesting in my usual slow thread-by-thread style. I rolled up most of the unwoven warp around paper and a couple of beams so that I could fit this long warp in my weaving space. That also meant that I could stay more or less the same distance away from the far beam which I think helps me maintain a consistent tension. I could roll up the woven length of band and, as I did so, unroll a bit more unwoven warp. You can see that I changed to a band lock after a while rather than continue using my long backstrap beam. There was just too much band piling up on the beam and it was getting uncomfortable having that wad of cloth at my belly. I got that nice long and heavy band lock from the Santa Cruz guild. It had belonged to the late Nora Rogers and it was given to me with one of her many fiber experiments in progress…a sprang Hopi-style sash. I still have the sash and can pop it back into the band lock at any time should I wish to continue with Nora’s sample. I have to admit that I prefer the length of my backstrap beams. I find having the backstrap around my hips sitting on those wide beams very comfortable. It felt a little strange having the ends of my backstrap pulled inward to sit on the ends of the short band lock. An advantage of the band lock is being able to slide the woven cloth out of the way between the two wooden bars very frequently. I didn’t have to wait until I had woven enough to roll all the way around two beams as I usually do. I could adjust length every inch or so if I wanted to. It makes it seem like you are progressing faster! In the picture above, you can see that I have cut off the finished length of the woven band and just left the unwoven warp clamped in the band lock. I figured that I could make a couple of wrist cuffs with the warp that remains. Let’s see if the band lock grips that unwoven warp well enough to enable me to do so. I am grateful for having this large heavy band lock. I am wondering if Nora Rogers had made this herself. Most of the band locks I have seen for sale are much smaller and lighter. You can see a small one sitting alongside my larger one in the picture above. That one was given to me by Becky and the staff at Vavstuga when I visited. The woven cloth was clamped and hung free rather than being rolled up around two beams. 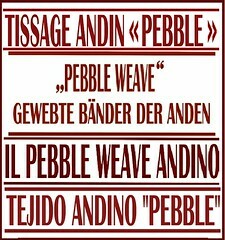 And, you can see in Marianne Planting’s Andean Pebble Weave project below, how the band passes around and between the wooden pieces to be locked off. The pattern she is weaving is in my second book. I haven’t become a band lock convert! I will, however, use it for long, long bands. I have another blanket waiting for its edging band and the band for that will need 136” or so of warp…. After washing and ironing the finished edging band, I folded it in half and stuffed the very center part that has the pick-up pattern with wool and sewed that into place so that it looked like a tubular band. Then, I sewed the band to the edge of the blanket by hand. I don’t have a machine and really enjoy hand sewing. What I didn’t enjoy was having the wool against by bare legs in the heat. The corners were tricky. Here you can see some details of the finished item. This 4-selvedge wool piece has been sitting around for quite a long time. I finally bought the purple wool that I needed to weave its edging. The edging will be a tubular band that I will weave and sew directly to the edge using the weft as the sewing thread. I think I will use the Chahuaytire-style tubular band. While doing that, I can think about the pattern and structure I want to use for the edging of the larger purple blanket. I need 82” of woven band for the 4-selvedge piece. I am using the small band lock to lock off the far end of the warp with all the excess warp pooled on the floor. This way I can extend the warp and fit in my weaving space and don’t have to roll up the unwoven warp around paper and dowels. I am finding some cool uses for these band locks! I have a couple of large and complex projects planned for this summer. They involve wool and silk and dyes and ikat tape and 3-color pebble weave and lots of risks as I venture into some unknown territory! I guess I am just getting warmed up for them after having been away from the loom for a while. It is nice to be able to finally finish some of these pieces that have been sitting around for some time. I have lots of ideas for more jewelry too…little things that I can weave when I need a break from the big stuff. 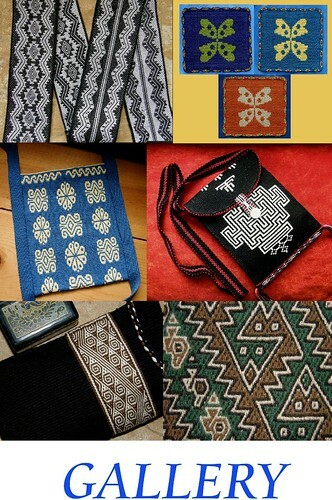 I have also been busy at the computer planning the dvd cover and disc design for my backstrap weaving class. Yes, that was what the in-front-of-the camera activity that I mentioned in my last blog post was about. There will be a dvd as well as the ability to stream the class. Until I have a release date for you, I will keep you in suspense! I am in suspense too! As always beautiful, inspirational work. I love your sense of color and design balance. Thank you so much, Marianne. Best wishes to you too. 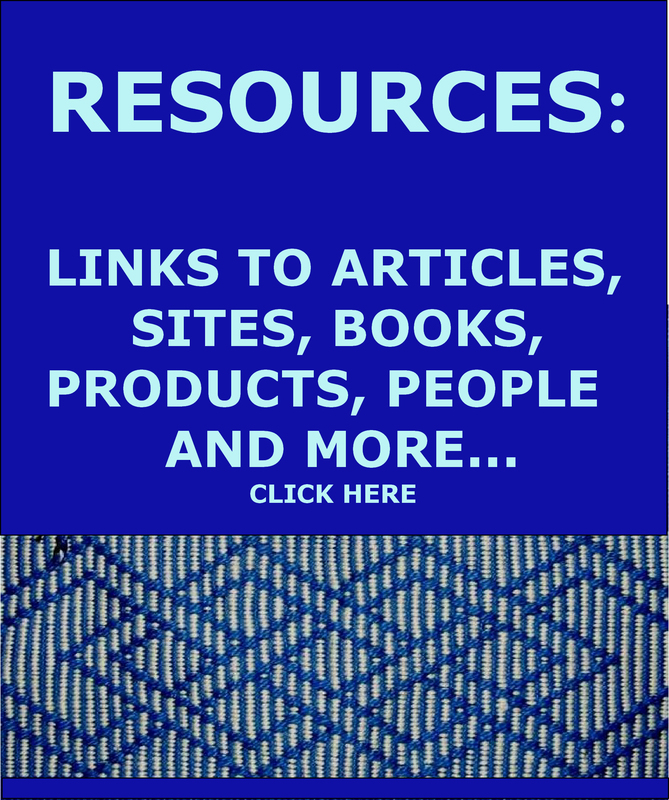 Thank you for allowing me to use your photos in my posts to inspire and teach other backstrap weavers. I use jewelry findings, Lidia. I think they are called ribbon clamps. They clamp to the ends hiding and protecting the raw edges of the band and then you can add other findings…rings and clasps…to connect the bracelets. I have not found a neat way to simply tie the ends together. The other thing I do is hem the ends (if the material I used is fine enough not to get overly bulky with a hem) and then attach a button to one side and a braided loop to the other. Your grandchildren will love your bracelets, I am sure. What a great idea! Very nice sewing on the lap blanket! I can see how those clamps could come in handy. I asked Sandrine Tricofolk who told me we must buy directly to you. 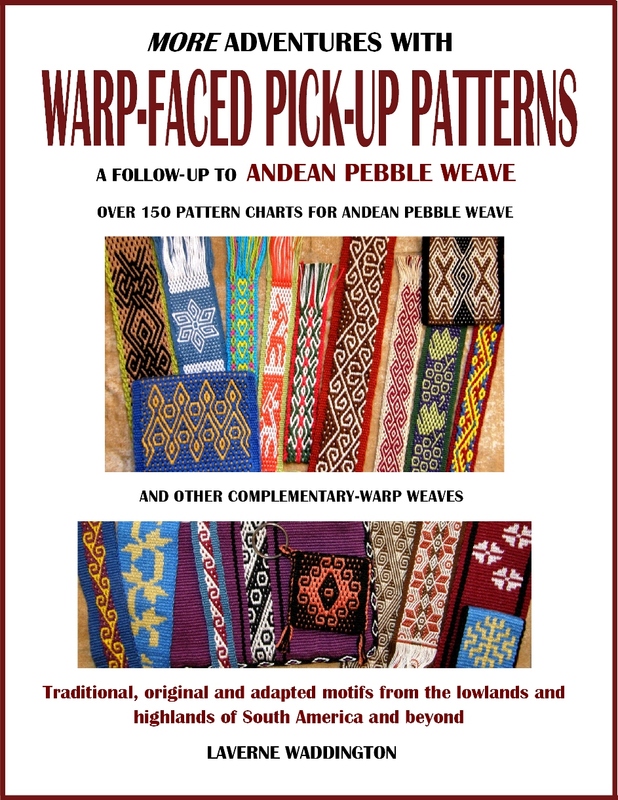 I weave the Andean Pebble weavings on a small 4 shaft loom. I’ll email you, Cecile, and see if we an sort something out about the book via Sandrine. Thank you!